To do a little reconnaissance for Robin Hood’s upcoming elk hunt. The success of item 3 was middling, but we executed flawlessly on items 1 and 2, so I think it’s okay. We weren’t the only ones who enjoyed ourselves. As usual when we go camping these days, we brought along our coonhound, Ann. 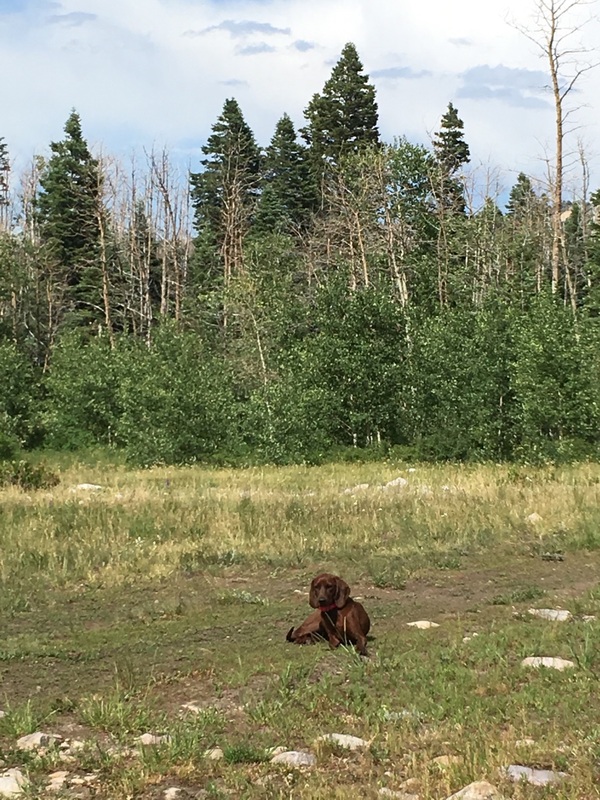 After all, dogs, like humans, need the wilderness every once in a while. Plus, we knew she’d be in good company since our friends had told us that they were bringing their two dogs. Puppy playdate! On this particular adventure, though, a question presented itself: to leash or not to leash? Historically, we’ve kept Ann leashed during camping trips, simply because we haven’t trusted her to stay within summoning distance. She’s generally well-behaved, but at just over two years old, she is a teenager, and we all know how that can go. However, the other two dogs would not be leashed. So did we want to listen to Ann whining out of restlessness and envy, but know that she was close by and safe, or did we want to take a leap of faith and trust that training and the good ol’ pack mentality would prevail? We took the leap and…it turned out fine. I had crossed my fingers that Ann’s fear of missing out, as I jokingly refer to it, would work in our favor. If her humans and/or other dogs are nearby doing something that seems interesting, she wants in on the action. I don’t know how big of a role that played, and she did keep wanting to chase the 4-wheeler (who can blame her? ), but everyone went home with the same number of dogs they came with, and that’s what matters! The dogs had a great time, and so did the humans. Ann got a taste of freedom, and Robin Hood and I got a taste of…something. Trust? Letting go? A lesson in healthy parenting? If we had kept Ann leashed, we wouldn’t have seen that she can, in fact, handle a little freedom. 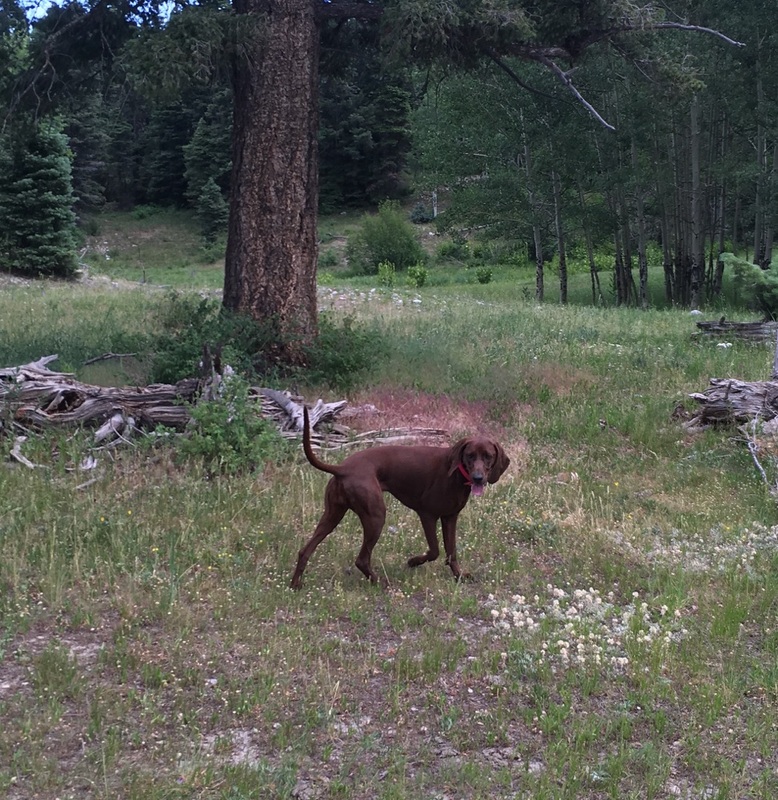 We wouldn’t have seen her romping with the other dogs, sniffing everything in sight, leaping over logs — joy personified (er, dogified?). We wouldn’t have felt that pride in whistling for her and seeing her come trotting back to camp, tail still a mile high. Here’s to leaps of faith and letting go. I’ve been unleashing my pup at certain events too… while terrifying, it is also really nice!